It's a Wonderful Time of Year! Today, as I sit and write this post, I am thinking of the blessings that we all have in life: family, friends, a home, a meal. The thought that there are children all around us that may not have a meal to fill their stomach, just makes my heart hurt. I am thankful that we can partner with Philabundance, No Kid Hungry and King’s Castle to help children in need in our communities locally, nationally and internationally. It is a very small thing, that has a big impact on a child’s life. Thank you all for helping support our “Patties with a Purpose” feeding program that supports the organizations that I mentioned. 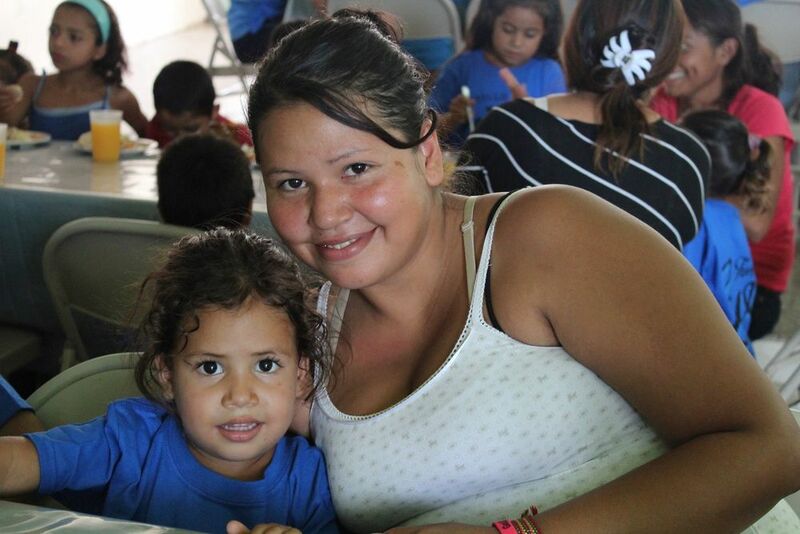 Our program has help feed 269,164 meals to children since its start. The simple act of purchasing a burger that helps a child in need is a direct result of your support. Thank you, Thank you, Thank you. May you have many blessings this season and be thankful for all you have. 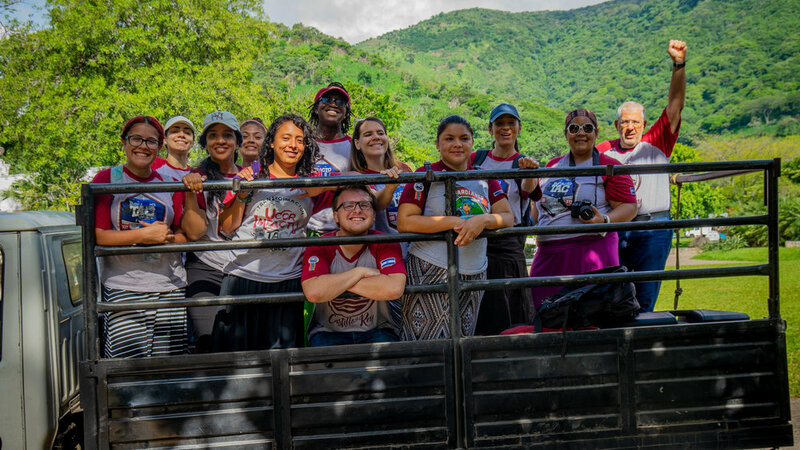 The special needs children that we were able to work with this year in El Salvador, We took them on a field trip to the nature reserve and spent the day, loving, laughing and eating together. We can not wait to go back again next year to love on them some more. LIONS, TIGERS, AND JOY! OH MY. At the end of June, we returned from our 10th trip to El Salvador, each year that we go, we enjoy the time spent with the people there. This year was a little different then past years, as we spent time with special needs children and young adults. It was an incredible time, as we loved on the them all. We spent the afternoon getting to know them and the next day we took them on a field trip to the nature reserve/ zoo. It was so nice to see the joy in these children and young adults as they learned about the different animals there. We worked with many who did not have the correct medical equipment to maneuver the rough terrain of the country. We hope that next year, we can bring equipment that will help them. Our hearts are filled with the love for these in need. We also were able to serve the children who are a part of the feeding ministry. Our “Patties with a Purpose” program proceeds go directly to providing healthy, fulfilling meals for the children at the King’s Castle feeding program. 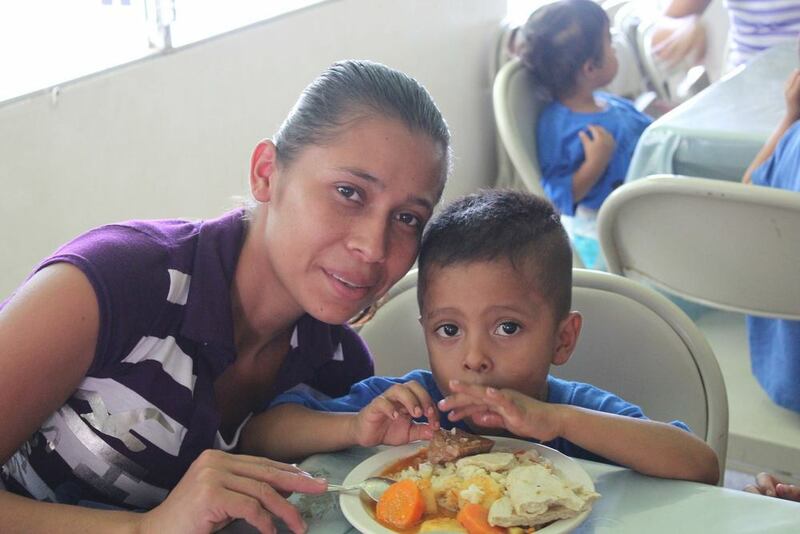 They are fed because of YOUR part in giving back, we could not do it without your help. For each burger purchased at Hunger Burger, a meal is supplied to a child in need. Since the opening of Hunger Burger and the start of the “Patties with a Purpose” program, we have been able to give funds for 248,988 meals to children in need. 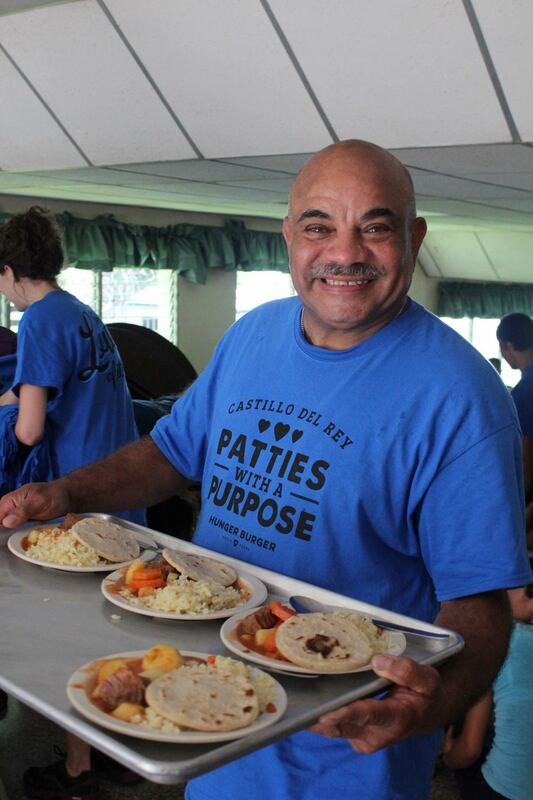 In addition to providing meals to children in El Salvador, “Patties with a Purpose” supports children locally through Philabundance, and nationally with No Kid Hungry. We also had the opportunity to take part in a family feeding distribution. Each of the 300 bags we help to assembled, will feed a family of four for a week. We then got to hand deliver these important packages to those who need it most. Every year, the families are so grateful to be given this support, some women will hug you so tight and look into your eyes, as to say “thank you”, or “Gracias”. The men will shake your hand and not let go until they know, that you know, that they are grateful. We love the people of El Salvador, an in our local and national communities, and we love our customers, who help us help children in need. Thank you for your part. It is an incredible feeling you feel, when you give back. I believe it is something we all need to feel. The photo above is of my son Christopher giving back. 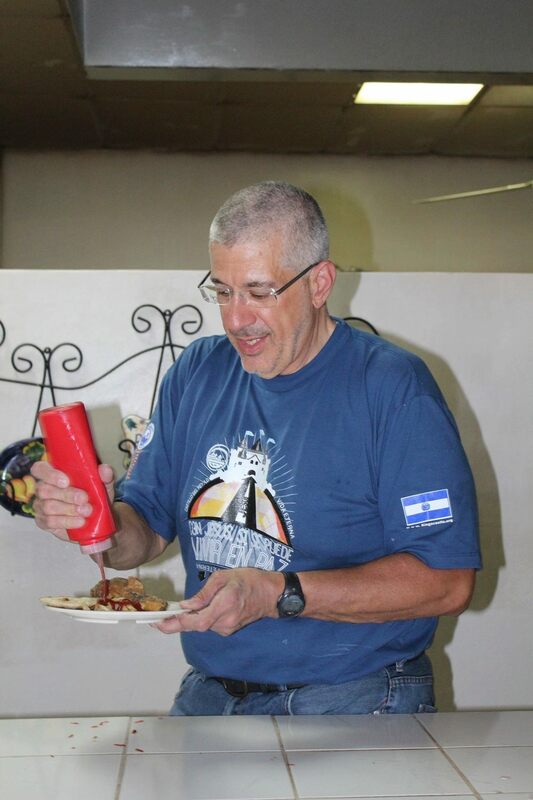 He was apart of many of our trips to El Salvador and here he is serving meals to the children in the feeding program that "PATTIES WITH A PURPOSE" supports. Over 227,000 meals have been given to children in need, locally, nationally and internationally through the program so far. We at HUNGER BURGER, thank you for your support. We are planning a trip to El Salvador this year, and we can not wait to see the children and share with you what your support has meant to them. As 2017 has come to its close we are thrilled about the amount of children who have received a meal because of the support of our customers. In the 4th quarter of 2017, an unbelievable number of meals to help children in need was raised, 18,392! Since the opening of HUNGER BURGER in 2015 and the start of our "PATTIES WITH A PURPOSE" program 208,456 meals have been shared with children in need locally, nationally and internationally. We cannot express the impact of this small act, and we are so excited to be apart of it. It was a wonderful year for us here at HUNGER BURGER and we are excited about what 2018 has to bring. We are currently in the process of planning our trip to El Salvador to see the impact that "PATTIES WITH A PURPOSE" has in this community. Thank you again for all your support and may you all have a Blessed 2018. PURPOSE is a verb - "have as one's intention or objective." The word PURPOSE as a verb means to "have as one's intention or objective". We are not sure of the intention in which our customers come to Hunger Burger for their meal, is it the fact that our beef is all natural, no hormones, no antibiotics, USA grown? Is it because we love our customers and our objective is to strive for the best for them? Or is it because our customers love the fact that our "Patties with a Purpose" program helps to feed meals to children in need, locally, nationally and internationally? Whatever your reason for being one of our wonderful customers, you have helped to feed over 190,000 meals to children in need simply by eating one of our many burgers. "Patties with a Purpose" program feeds a child in need with every burger purchased, so again thank you for your loyal support of Hunger Burger. Summer has been full of adventure for us at Hunger Burger. For 9 of the last 10 years we have been traveling to El Salvador to work with the people there. This July, we were there for a week working with the children and helping with the feeding program at King's Castle, which we support through the "Patties with a Purpose" program. We have seen that the feeding program has grown a great deal since last year. This is disheartening because that means more children are in need, but it is exciting that we are helping King's Castle meet a great need there. During our time in El Salvador we were able to see all the children we have worked with over the years and also meet so many new children. We feel that they are apart of our hearts and family and are thankful for the ability to see them every year. If you could see first hand the impact that the "Patties with a Purpose" program has on the lives of these children, you would be over joyed with the fact that such a small act can do so much. As of the end of the second quarter of this year, the "Patties with a Purpose" program has help provided over 173,000 meals to children in need with in our local, national and international communities. Thank you for your support, this support has a mighty impact! 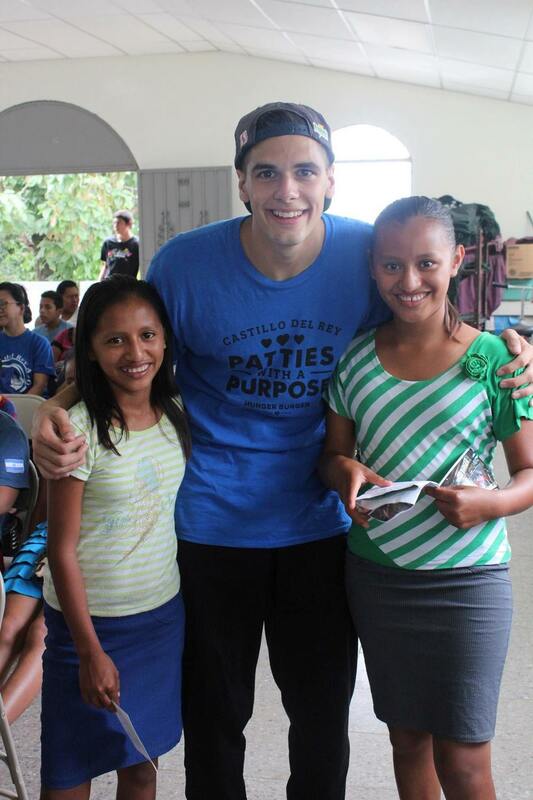 The photos below are a small glimpse of our time in El Salvador. Spring is here and we here at HUNGER BURGER have a spring in our step, because we are so excited about the support you have shown to our feeding program "PATTIES WITH A PURPOSE". With the close of the first quarter of 2017, you have helped needy children locally, nationally and internationally receive 19,214 meals this quarter alone. Since the program start in 2015, 153,148 meals have be received. Together with our sister location BY GEORGE and their "YOU HAVE A STEAK IN IT" program 214,735 meals have be received by children in need. Yes, can you believe it, just because you came and had a burger or cheesesteak, children are being fed. We can not thank you enough for all your support and help you have given to us. THANK YOU. Happy New Year to you and yours. 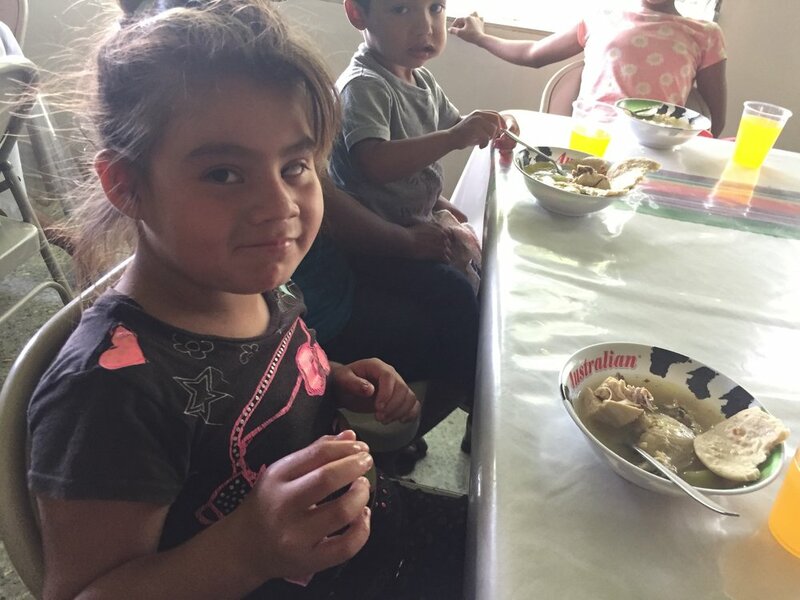 We are so blessed to share with you that in 2016, you helped to feed 70,218 meals to children in need, in Philadelphia, the USA and in El Salvador. Since the "PATTIES WITH A PURPOSE" program started in February of 2015, 133,934 meals have been donated to needy children. Because the program has been such an unbelievable success, in March of this year, * By George Pizza, Pasta & Cheesesteaks our sister location, started the "YOU HAVE A STEAK IN IT" program (with every cheesesteak sold, a meal is given to a child in need). This program has helped to feed 49,485 meals to children. It is incredible to think that with the simple act of enjoying a burger at Hunger Burger or a Cheesesteak at By George, 183,419 children have been fed. Thank you so much for your support, we are passionate about helping those in our local and global communities while doing what we love - serving you. Third quarter end is here and the LOVE is incredible. 17,386 meals for children, locally, nationally, internationally just this quarter alone and it is all because of you! This year to date 51,232 meals have been given to children in need through the "PATTIES WITH A PURPOSE" feeding program. As we prepare for the holidays this year remember the blessings before you, as you have blessed so many children with your LOVE. Thank you so very much for your support. Second Quarter has ended....look what you have done. It is the end of the second quarter of 2016 and we just sent out the funds raised through "Patties with a Purpose". What have you all been a part of? Helping to feed meals to children locally, nationally and internationally with the funds raised with every burger we sold, 16,201 meals are available to these children. From the coins that you placed in the "Patties with a Purpose" burger bank an additional 2,140 meals were donated. THANK YOU so much for the support that you have not only shown to Hunger Burger but to the "Patties with a Purpose" program as well. 2016 A New Year.....A Big Thank You ..... and a Sister Program! Greetings from King’s Castle El Salvador! Thank you for your generosity, for everyone working at Hunger Burger and for every customer who purchases a Burger. 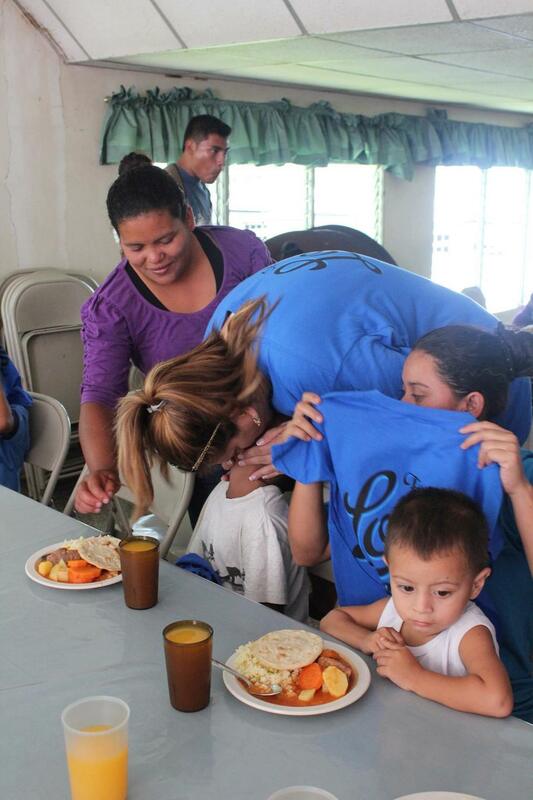 In so doing everyone is contributing to ease the hunger experienced in the lives of children in El Salvador. The Feeding Centers are strategically located where most needed. 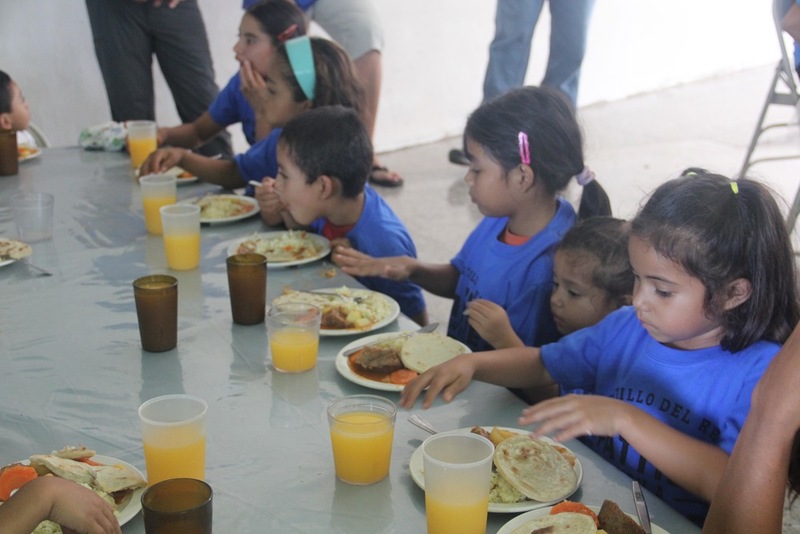 The children are pleased to receive nutritious food 2-3 times a week depending on the program. On behalf of these wonderful children, Thank You! While the children can’t actually say thank you on their own we say “Gracias” on their behalf. Together we are making a difference in the lives of these children. And that is not all, on March 1st our sister location, By George Pizza, Pasta, & Cheesesteaks launched their own feeding program "YOU HAVE A STEAK IN IT". With every cheesesteak sold a meal will be donated to a child in need. 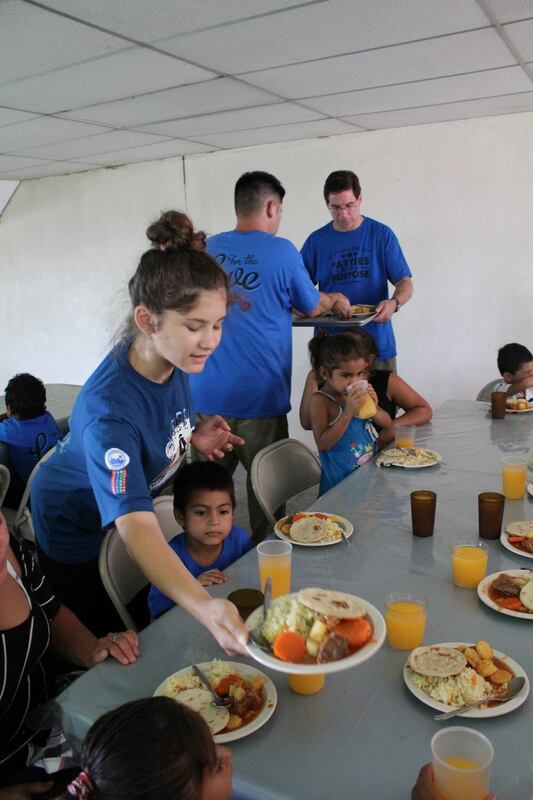 In the infancy of this program By George was able to help feed 6,501 meals to children. Soon you will be able to follow on the By George website for more information. A big THANK YOU to each of you. Third Quarter figures are in! We just finished sending the monies for the meals for this quarter. What a blessing it is to write out the checks to the 3 charities we support through "Patties with a Purpose". We are so honored to help children get fed, locally, nationally, and internationally - and it is all because you support us here at Hunger Burger! 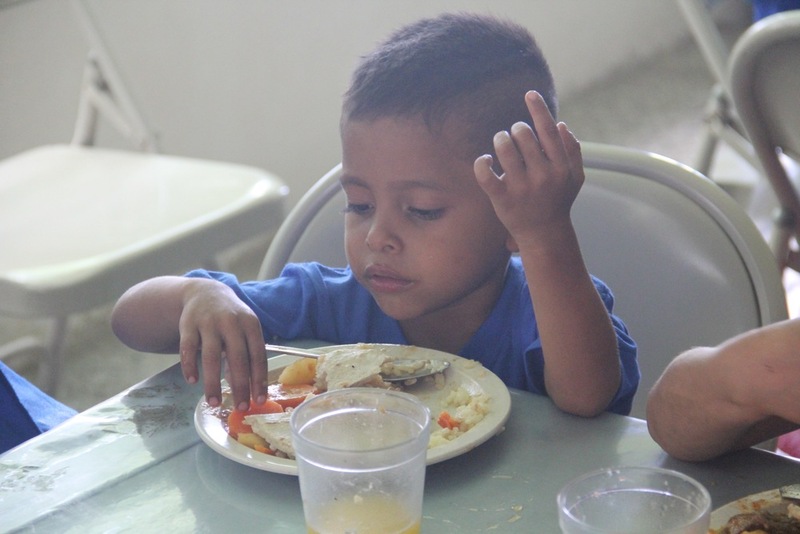 This quarter we are able to feed 14,700 children. Since we opened on February 2nd of this year, you have helped feed a total of 43,656 meals to children in need. My heart is so excited, and it is all For The Love Of It! It's Monday, July 20, 2015, We arrived back in Philadelphia on Saturday night after a wonderful 8 day trip to El Salvador. One of the organization that Hunger Burger supports through our "Patties with a Purpose" program, is King's Castle located on Lago de Coatepeque in El Salvador. This place is so beautiful, one of El Salvador's largest lakes and is surrounded by green mountains. 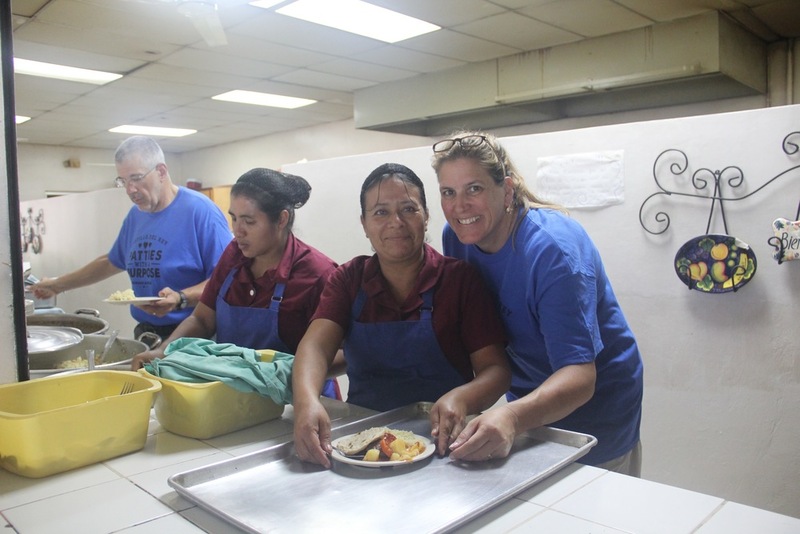 George and Kim have visited here for the last eight years with Kingsway Church- El Salvador Missions Team, this year the Kingsway's team provided medical care, food, construction, women's and children's ministry. The people that live here are beautiful people who are very poor, but have an incredible spirit about them. Over the last eight years we have watched these children grow and have become very attached to them. Although we do not speak the same language verbally, the love that is shared is incredible. On Monday, Wednesday and Saturday each week, King's Castle provides a hot meal for the children that live around the lake area and it was a blessing to our team to be able to help serve the children. With your support these children receive a meal, three times a week. along with love and compassion. The kitchen at King's Castle is in need of a major updating. If you are so led to donate to this cause please use the link by clicking the link provided, in comments for donation please enter Kitchen Renovation-HB. Thank you very much for your support. We are Flipping with Excitement! We just finished tallying up the 2nd quarter burger sales for our "Patties with a Purpose" feeding program, and we are flipping with excitement. Because of you and your love for burgers, we are able to send funds out to feed 16,792 meals for children this quarter. This brings our total meal donations, since we opened on February 2015, to 28,956 meals for children. This is so incredibly awesome. In two weeks, we will be heading down to El Salvador to work along side of Don & Terri Triplett of King's Castle. 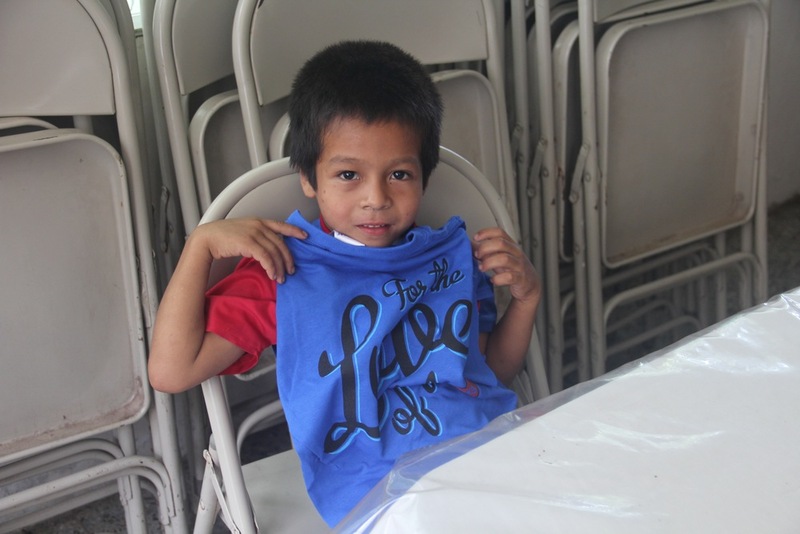 We are excited to see the children that are directly impacted by your support. We will be sure to update the blog with the stories and photos from the children who receive support because of you. Thank you so much for supporting us at Hunger Burger, we work everyday "For the Love of It". The Grand Opening of Hunger Burger back on February 2nd came with great anticipation. We have desired for many years to be able to give back through our business. Finally, after much hard work, months of brainstorming and planning, and dedicated prayer, all of our preparation came to culmination with the debut of Hunger Burger and our "Patties with a Purpose." We have be overwhelmed (in a good way) at the response to Hunger Burger. Our friends and family, loyal long-time customers, fellow market merchants, the press, and new faces visiting our restaurant supported our venture whole-heartedly. We feel so blessed that because people love our burgers (!) and want to give back, too, we are excited to announce that this quarter, after just two months of operation, Hunger Burger has raised funds to feed over 12,000 meals to children in need. Keep following, and stopping by for a burger, to see what we are able to do in the coming quarters, and our first year at Hunger Burger! Thank you, from the bottom of our HB hearts, for choosing our restaurant for breakfast, lunch, and dinner. Everything we do at Hunger Burger is "For the Love of It", so thank you for helping us be able feed children who are hungry.